We’ve all had the Chicken and Rice Bake that uses Cans and Cans of Cream of Whatev Soup and envelopes of Dried Onion Salt Dust that bakes for hours and tastes LIKE HEAVEN! This is kinda like that only different. 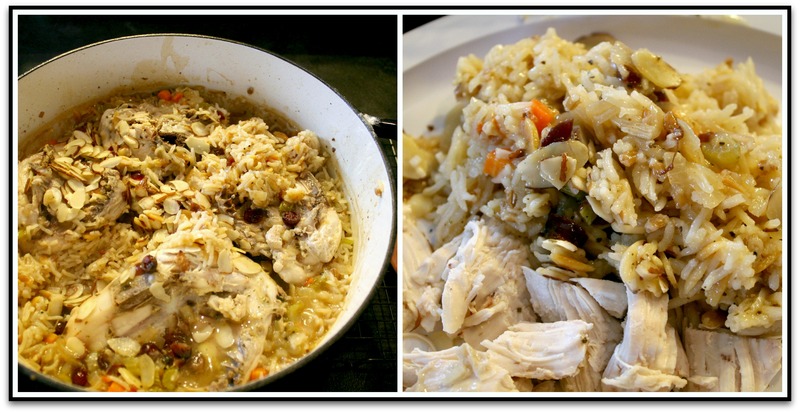 Chicken and Rice…..The New Way…..uses no cans or envelopes and didn’t even take that long to whip up! 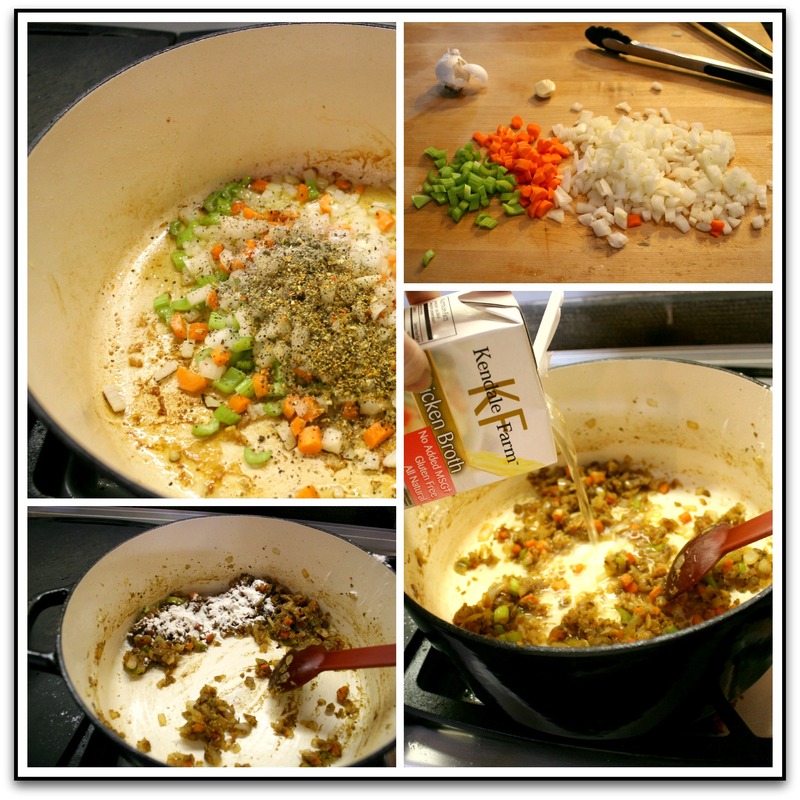 One plus with this recipe is I used only ONE DISH! This time, I used the new pot my brother surprised me with for my Birthday. It’s a really really BIG Cuisinart Enameled Cast Iron Pot in my favorite color…Black. I deconstructed the recipe pretty much on the spot. Brown Chicken, Saute Vegetables, Add Rice, Bake. 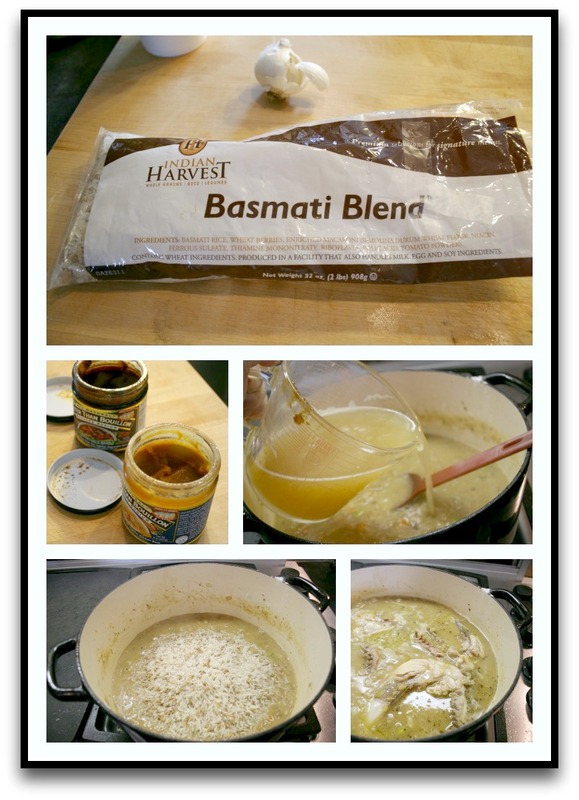 I love using Indian Harvest products. The company is right here in the midwest…from Minnesota. I also use Better than Bouillon for ALL my stock if I’m not using homemade stock. The only chicken I use is Smart Chicken brand. The Chicken Broth I’m adding here was a gift from my brother and it was very good. Saute 4 Chicken Breasts in Olive Oil in a large pot. Remove to a plate when browned. Saute 1 Onion, 1-2 Carrots and 1-2 Celery and 1 Garlic Clove in the remaining oil. Sprinkle on some Flour (about 1/4 cup) and stir for a few minutes. Add Salt, Pepper, and any other spices you like with chicken. 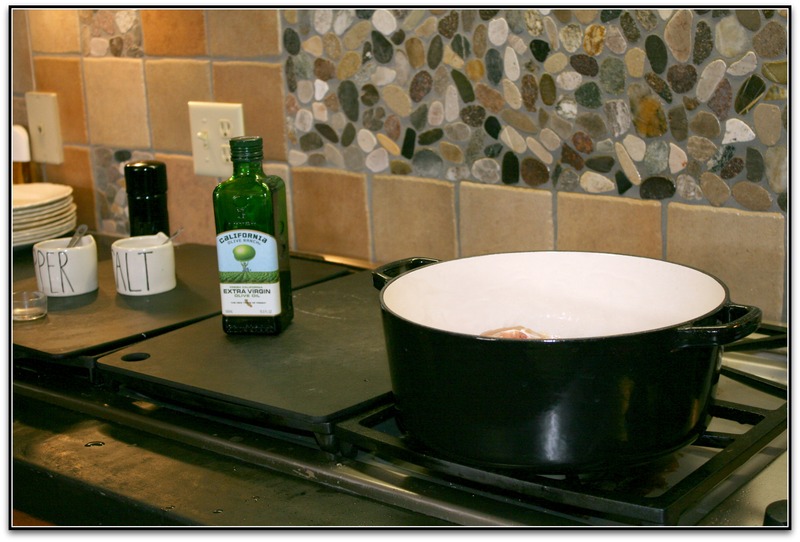 Deglaze pan with 1/2 cup of water or wine or apple cider or beer. Add 2 cups Rice and 4 cups chicken stock. (I use a combination of chicken and vegetable) I also added a handful of cranberries and a 1/2 cup of sliced almonds. Slide the chicken breasts back in and bring to a boil. Put on the lid and place in the oven at #300* for about an hour. This recipe probably makes enough for 8 people! There will be leftovers and that’s a Good Thing!